The Army is on the hunt for a high-tech weapon to replace the standard issue rifle for it's Next Generation Squad Weapon program (NGSW). The service believes it can spark a "revolution in small arms" on par with what the iPhone did to cell phones. Army officials at the Armament Research, Development, and Engineering Center at New Jersey’s Picatinny Arsenal told Task & Purpose last week that the purpose of the NGSW program, in which the military is currently soliciting bids to replace its M16 rifle, M4 carbine, and the M249 light machine gun with a 6.8mm gun, is to create an iOS-like platform for killing. "Imagine that Steve Jobs and his engineers were trying to convert the iPod Touch to the first 3G iPhone," said Army Col. Elliott Caggins, project manager for soldier weapons. "There were a thousand technologies they could have put in the first iPhone but they were looking to mature the platform before they could actually go onto the system." 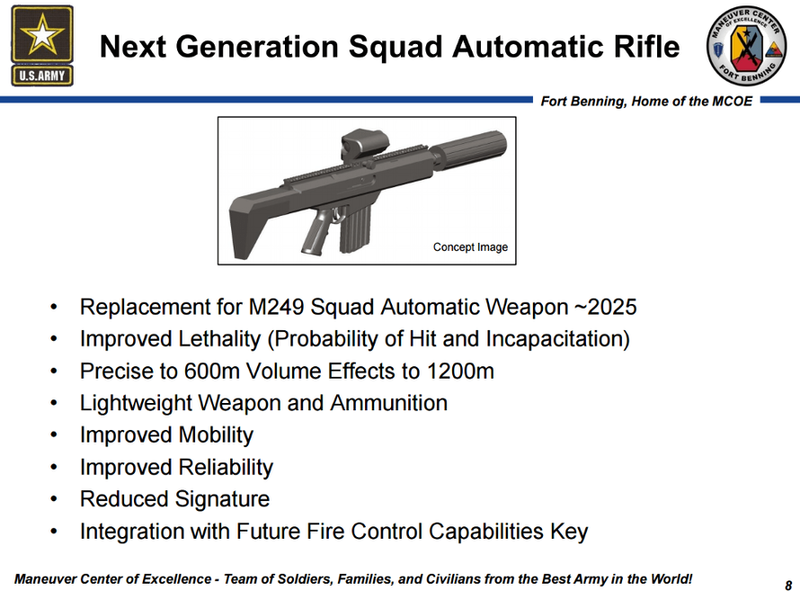 In the last 12 months, the Army published several notices asking private defense manufactures across the US to submit their futuristic rifles to the NGSW program for testing. The Army is not interested in improvement programs for current guns that have been in service for decades, but rather a new weapon that can shoot further and have the ability for sophisticated add-ons or modifications. Task & Purpose said, NGSW officials expected the rifle to include "a specially-designed fire control system engineered to boost hit probability at extended ranges," "an onboard processor hardened against cyber attacks," and a multi-laser rangefinder system to increase the probability of killing the enemy. "The operator, as he lases the target, instantly gets an aim point and the system adjusts for ballistics instead of the operator trying to figure things out," Fiorellini told Task & Purpose. " The Army also wants the rifle to have a suppressor base and "aim augmentation" system in the future. The NGSW project expects to integrate the weapon into a heads-up display system that will be mounted in tactical helmets. The Army expects to field its "iPhone of lethality” by 2022. The first soldiers to receive the weapon will be the “close combat 100,000,” which include infantry and reconnaissance units.